Hello Simple Stories friends, Emily Pitts here today. Are you recovered from the holiday bustle? I know I'm enjoying the time with my family immensely! We have a wedding reception this weekend, so I pulled out my favorite Simple Stories line, the SN@P! collection and whipped up this Love card in no time flat. I used to buy my cards, but have sinced turned into a card maker. It's so nice to get a lovely handmade card, don't you think? You could use the same design and easily change the sentiment to fit your needs. I cut a 1/2 inch strip of the the Yellow Stripe paper, then turned the sheet a quarter turn and cut another half inch strip off the side. This allowed me to make a chevron look with the two strips. I wrapped the chevron with some twine, then cut a 5/8 inch strip fromt the 6x6 pad, v'd one end and added my sentiment with the small letter stickers. I punched a small doily and decorated it with one of the hearts from the sticker sheet. I used dimensional adhesive to make the banner stand out. To finish, I double matted the kraft on the 6x6 red graph paper and then on the turquoise dot paper. Super quick and easy, and perfect for the new bride and groom! Isn't it hard to let go of the holidays? We all spend an incredible amount of time preparing and then before you know it, the time has come and gone. Why not extend the festivities a little longer by sending out just a few more cookies. I found this adorable snowman shaped box at my local grocery store (on sale since it was so close to Christmas). It was already somewhat decorated, but I decided to make it even more adorable by recovering it with the Handmade Holidays. I chose two pieces of patterned paper to line the outside of the box. Then I measured and cut the strips of paper, matching up patterns where I could since it took more than one strip to go around the box. Then I used a tape runner and glue gun to adhere the paper to the box. I would recommend using something like Modge Podge to seal the paper to the box in order to make it more durable and ready for a second use. To recreate the design, I used a plain piece of copy paper to trace some of the elements on the box and then cut them out as a pattern. Then I used the pattern to trace on the papers I selected from the Handmade Holiday collection. Pop dots on the buttons and part of the scarf make the design more fun and dimensional. Finally I added some sentiments with cardstock stickers from Simple Stories Handmade Collection. This will be a fun gift for a neighbor or a friend. Have a wonderful time keeping up the holiday spirit! I fell in love with this layout the moment I saw it, and that twine running through the layout really caught my eye. I've always admired Wendy's style, but me, I'm more of a clean and simple gal. This is why the Sn@p! line and I get along so well. And if I'm being perfectly honest, I have a bit of an obsession with polka dot and grid paper. So, I turned to both and came up with this layout. For me, scrapping needs to be a non-stressful and FAST event these days. This layout held up its end of the bargain taking just under an hour to create. In my world, that's some fast scrapping. The elements down the side consist simply of a piece paper cut from the Sn@p Life collection as well as the days of the week stickers. I then added the twine (thank you, Wendy) and the letter stickers to the bottom. Finally, I misted a wood veneer frame and adhered it to the cut out piece and added a heart sticker with a pop dot. So, next time you need a little inspiration, I hope you'll wander here to the ol' Simple Stories blog and check out some of the posts you may have missed or revisit some favorites. You might just find the inpsiration you've been looking for! I love being able to create layouts in a short amount of time & not have to spend hours & hours (or sometimes even days). That's why I absolutely adore Simple Stories Sn@p collection. It is so versatile - going with pretty much any theme that you can possibly think of! I used the Sn@p collection to create two 12x12 layouts. The first one is about my daughter turning 12. Still can't believe that I gave birth to her twelve years ago. How time flies. My second layout I created about my dad's 70th birthday. Both my daughter and my dad have birthdays in the same month and a little over a week apart. My dad wanted to do something fun & memorable with his grandchildren. So on the day of his birthday he picked up all of the children from school. I drove them (because I was also the photographer :) to one of our family favorite ice cream stores right on the beach. Dad treated everyone to a delicious ice cream cone. The kids loved it! We hung around the beach for a while throwing stones into the ocean and I took a few pictures of Grandpa with his 5 grandchildren. The Sn@p collection has such fun colors that they just make you smile. So they were a perfect match for these photos - as it was such a fun day for everyone! Hello there! Donna here as your host this Saturday. I'm going to keep this post short and sweet... well, hopefully you will find it sweet! If you are anything like me then you still have quite a few things to do on your pre-Christmas to-do list. So today I will just quickly share a card and two gift card holders that I made using Sn@p! I happen to love poinsettias. I grew up in South Texas and they instantly remind me of Christmas. I fell in love with this one and wanted to use it for a card. Because it is such a bold flower, I kept the rest of the card very simple - simple is good this time of year! Next up are these, again, very simple gift card holders. I think the combination of the gray, red, green, and aqua is actually a fun twist on traditional Christmas colors. I used the basic pockets from Sn@p! 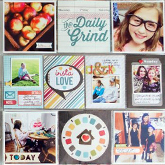 plus various papers from the Life Basics and Color Vibe 6x6 paper pads along with a couple of Sn@p! Life Stickers. The 3x4 pockets happen to be the perfect size for gift cards. I think these would be fun stocking stuffers, don't you think? I hope you have a great weekend, and I wish you and your family a very Merry Christmas! THANK YOU! to our friends at Helmar Adhesive for sharing all of their fantastic products and fantastic talents with our blog share! We are happy to announce our Simple Stories - Helmar Adhesive Blog Share WINNER!! I love that first layout about the gingerbread! The kraft paper goes so well with the subject, and I love the bright colors with it. Awesome design. Also love the bow towards the end! All wonderful projects! Thanks for sharing. Congrats Katie! please email your information to sales@simplestories.com and we will get your prize right out to you! Hello there, it's Kellie here today with a very simple project! I have loved working with Handmade Holiday, it is such an adorable paper line. The colors are awesome and the details are so darn cute. These little trees are so easy to make, I was a little embarrassed to post it as my project! I can say I have truly used up every bit of my Handmade Holiday Collection. To make a tree gather your scraps, a small pot, white paint, a dowel, a piece of styrofoam, burlap, and some moss (or filler for the pot). I started by painting the pot and the dowel white, the pot is on the smaller size about 3 inches tall. When I started the project I was using a much larger pot (6 inches) and it just didn't look right. The smaller ones are the way to go. Stick a piece of Styrofoam down in the pot, it doesn't have to be perfect just shove it down inside the pot. Place the dowel down in the styrofoam, my dowel is about 12 inches long. Put your moss around the top of the pot. I had a piece of burlap that I cut into strips, nothing perfect about 4 inches long by 1/4 wide. Remember this project is super Simple! The strips of burlap are your spacers in-between the scraps of paper. You could also use ribbon or fabric if you don't have burlap. I tied about three strips of burlap on the base of the dowel. Then I took 3 pieces of my biggest scraps about 3 x 5 (remember it doesn't have to be perfect) punched a hole in the center and slid it over the dowel. Then I tied some more burlap strips on the dowel and then more paper scraps. I used smaller pieces of scraps as I moved up the tree. So there it is my very Simple project! I hope you enjoyed it, I sure had fun making it. I officially have to get some more Handmade Holiday! Have a wonderful day! Handmade Holiday // "Celebrate the Season"
Festive time is here! Celebrate, celebrate, celebrate the season! 5 days until you knock down Santa for those fabulous presents, stuff your bellies to the max, and enjoy the time with family & friends! Hi all, Wendy here to share up my project with a bit of festive play on the season using the "Handmade Holiday" collection. This collection is perfect for all the awesome Xmas pics you've taken/still to take this month! SO many beautiful colors & the vintage twist in this collection and the perfect backdrop for my layout. I used the following key pieces from "Handmade Holiday" . I must admit the red glitter snowflake ornament rather inspired my layout while out & about shopping. I knew I wanted to use this on my project and even sat it on my art desk as I thought on the process to work into my project. Then, I just worked in the details around this focus embellishment using various layers to add interest and texture. The 3x4 inserts in the collection are perfect for layering. Also, the little piece of gift wrap peeking from behind the manila tag is from my recent Xmas gift from my boyfriend. So, I wanted to add it into project without using the entire piece of gift wrap. So, this simple touch of it was perfect for me. Also, lovin' the "washi tape" type stickers I used on the tag. FUN. The red letter stickers ("xo") in the collection are the perfect size for layering onto your photos, mini projects, and cards too. My other bits & pieces of festive play with stamping and embellishments are from random eclectic finds and from my stash. (and I insert, nope not real peppermint candy but they are resin sparkly peppermints) :) Hey, what's the season without peppermint, right? I love this piece of the project with freehand swirling of inks, whimsical baker's twine, sparkle, and dimensional accents. Now, go have a festive holiday & don't forget to create it up with some "Handmade Holiday" with all your awesome holiday pictures! Cardstock: American Crafts; Ink: Ranger - Distress Ink - Fired Brick; Mist: Maya Road - Charcoal #MST1628, Large Red Metallic Snowflake: Michaels Craft Stores; Stamps: LifeLovePaper, Prima; Transparency Film Tape: Advantus - Tim Holtz; Wood Veneer Shapes: Studio Calico; 5mm Metallic Sequins: Treehouse Studios; Resin Peppermints: Source Unknown; Manila Tag: Avery; Baker's Twine: Maya Road; Washi Tape: Recollections; Resin Reindeer: Recollections; Diecutting Machine: Silhouette Cameo. 'Tis the season for gift giving and Simple Stories has you covered. What better way to celebrate this wonderful time of year than with some quick handmade tags to attach to packages of goodies. I pulled out my Sn@p 6x6 Color Vibe and Just the Basics paper pads and my die cut machine and set to work mixing and matching colorful patterns. Chevron and polka dots...two very merry pattern mixes. Once I had my tag bases made, I started layering on embellishments beginning with the Sn@p Stickers Labels and Sticker Icons. The Sn@p stickers provided such playfulness and character...all that was left was adding buttons, gems, and ribbon. Now my goodies are merry & bright and ready to share with someone special this season.